Dr. Jon Reid, a Professor of Psychology and Counseling at Southeastern Oklahoma State, talks about depression following grief with Dr. Heidi Horsley at the Association for Death Education and Counseling (ADEC) conference. He’s a certified fellow in thanatology from ADEC. “How do I know if I’m depressed or just grieving?” That’s a common question from those who have experienced a loss. If someone thinks they’re depressed, they might wonder if medication is part of the answer. Medication isn’t necessary for grief, explains Dr. Reid. Grief is a natural response to a loss, but it can be hard to tell if/when depression creeps in. Concern should happen if someone’s sadness keeps them locked in their house. How long does grief take before knowing it’s depression? That’s tough to gauge since everyone is different. 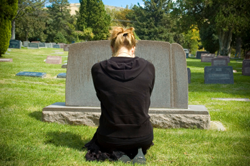 Grief lasts much longer than a few days or weeks, explains Dr. Reid. You can feel those intense feelings of sadness for the first year or several years depending on the type of loss. Most of that sadness isn’t constant with grief—it is constant with depression. Those who haven’t had a loss are often surprised by how others grieve. Certain times of year, such as the holidays, can bring up feelings of grief all over again. The sadness and anger can come back without it being grief. Those who are truly depressed after a loss need to talk to someone they trust. There are support groups, professional help, crisis hotlines, and family members. Some people prefer to write about it, not talk about it. Over time, those intense feelings will wane a little bit. However, if depression is part of the situation, that may not be the case. It’s important to determine whether it’s grief, depression, or both.